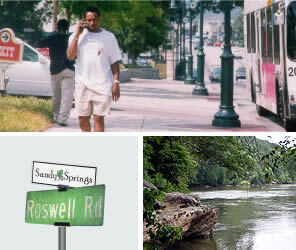 Protecting trees and connecting green space is a top priority in Sandy Springs, Georgia’s sixth largest city. Atlanta Tree Arbors provides prompt and safe tree removal services in Sandy Springs, in compliance with Sandy Springs and Fulton County tree removal regulations and requirements. Call 770-256-4599 for a free tree removal estimate in Sandy Springs or in Fulton County. The tree service professionals at Atlanta Tree Arbors have the training, knowledge and equipment necessary to handle any tree removal job in Sandy Springs and Fulton County, so call us today for a free tree service estimate or insurance work. In Sandy Springs, a permit must be obtained for the removal of any tree 18” or larger. A specimen tree, 27” hardwood or 30” softwood, requires a site visit from a City Arborist. Contact Michael Barnett to notify him of your intentions. In many cases, like that of fallen trees or hazardous trees, and email with an attached photo may be acceptable to begin work. # Atlanta Tree Arbors did a great job removing trees from an area that had little access. The were professional, fast and left the area looking untouched. AND . . .their crew came out when expected for a reasonable price. I would use these guys again anytime I have trees to remove or trim. # I'm impressed with Atlanta Tree Arbors courteous customer service, from submitting a quote to cleaning up after the job. Their skill and knowledge won my confidence and I am happy to have them as a trusted resource. I will definitely use them again and regularly recommend them to my friends and colleagues.